The speed limit on the road is 100kmph. 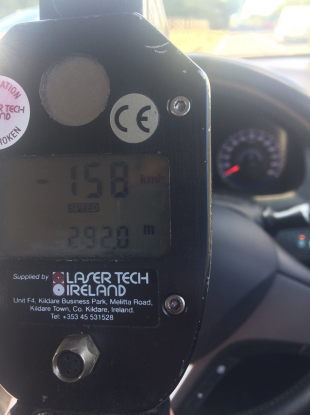 GARDAÍ THIS MORNING pulled in a driver who was doing 158kmph on a motorway. The incident happened on the N11 around Newtownmountkennedy and driver was pulled in by a unit from the town’s roads policing unit. The driver was issued with a fixed charge penalty notice for both speeding and driving without due care and attention. In Louth, a roads unit from Dundalk spotted a driver and passenger not wearing their seatbelts. When pulled in, it transpired the driver had no licence, insurance, tax or CVRT. The vehicle was seized, both the passenger and driver hit with penalty points and a fine and the driver will be summonsed for driving without insurance. Email “Gardaí stop driver who was going 158kph on 100kph road”. Feedback on “Gardaí stop driver who was going 158kph on 100kph road”.